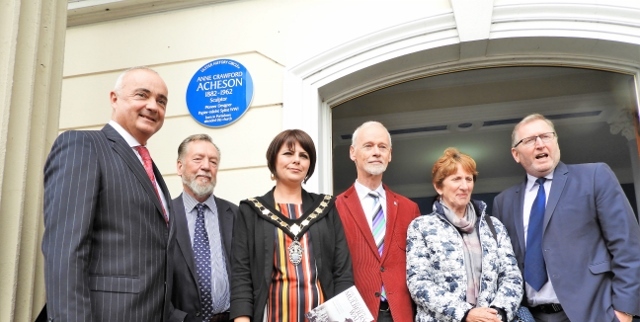 Anne Acheson Blue Plaque Unveiling. 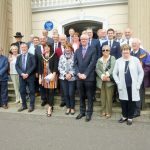 The extended family and guests which included the first lady Lord Mayor of Armagh City, Banbridge and Craigavon Borough Council, gathered at the First Portadown Presbyterian Church to honour a lady who had been largely forgotten in history. Sculptor, Anne Crawford Acheson, born locally in I882 in Carrickblacker Avenue, revolutionised the treatment of fractures during the First World War, and such was Anne’s ground-breaking achievements that she was awarded the CBE by the King in I9I9. The use of Plaster of Paris which Anne used in her sculpture was to change medical history for decades. Rev. Robin Brown welcomed the assembled audience to the Church in which Anne was christened by her missionary grandfather, Rev. Dr. James Glasgow and this was the church which the family attended; her father being an elder. 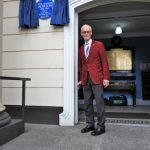 The ceremony continued with Chris Spur, Chairman of the Ulster History Circle, introducing the Lord Mayor of the Council, Julie Flaherty, the sponsors of the UHC Blue plaque, Richard Hanna from the Ulster -Scots Agency, and Doug Beattie, local MLA. 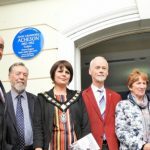 Doug Beattie was not aware of the local connection to Anne Acheson and thanked the chairman of the Edenderry Association, Shirley Banyan for bringing Anne Acheson’s name and her achievements to his attention. 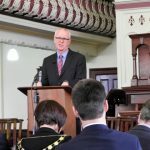 He spoke also from a military point of view of how important Anne Acheson’s achievements are still being used in frontline war regions all around the world. 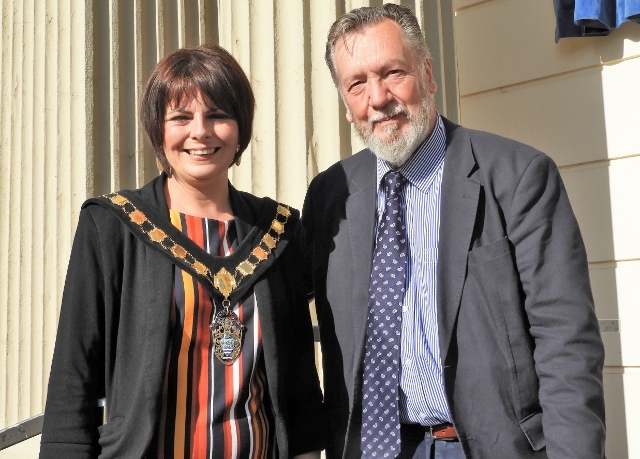 He was proud to be associated with the event and also said that the local community were absolutely delighted. Messages of congratulations were read from members of the extended family who lived in England and could not attend, and this included one another great-nephew, Rev. J. Malcolm Acheson and Mrs. Pauline Acheson, and from author David Llewellyn whose book, ‛The First Lady of Mulberry Walk’ covered the life and times of Anne. After the unveiling, refreshments were provided by the Ladies Committee of the Church. The event received extensive press coverage, both locally and on the mainland. Northern Visions TV also covered and at the beginning of November, the BBC are showing a documentary film on Anne Crawford Acheson and there is to be an exhibition in Portadown in 2019. 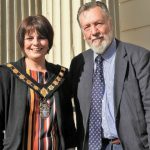 Speaking at the event and also afterwards, Councillor Julie Flaherty, Lord Mayor of Armagh City, Banbridge and Craigavon Borough Council, said that she was delighted to see that a local lady was being honoured with a Blue Plaque. This was a story that needed to be brought to the fore. Until now it had been buried in the annals of history. She thanked everyone involved with the event, and looked forward to seeing the film. 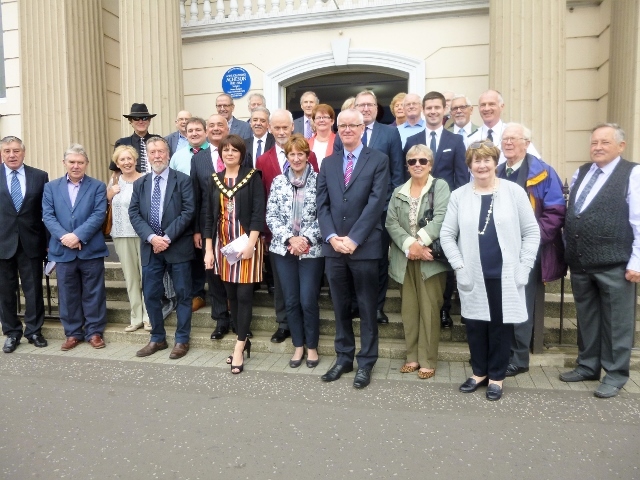 Chris Spurr, Chairman Ulster History Circle greets Councillor Julie Flaherty,Lord Mayor of Armagh City, Banbridge and Craigavon Borough Council. 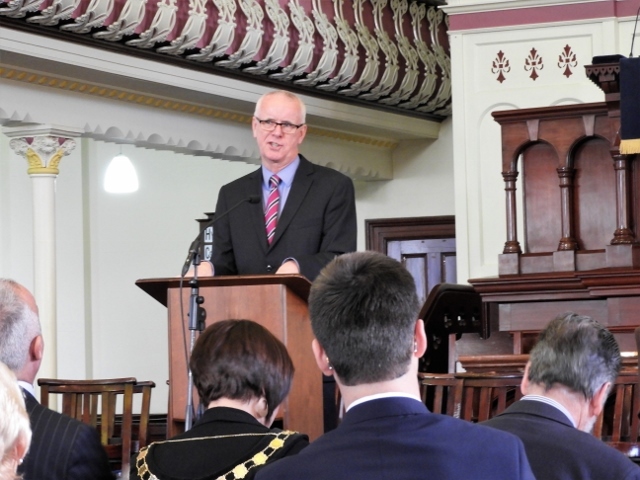 Robin Brown, minister of First Portadown Presbyterian Church welcomes guests. Rev. 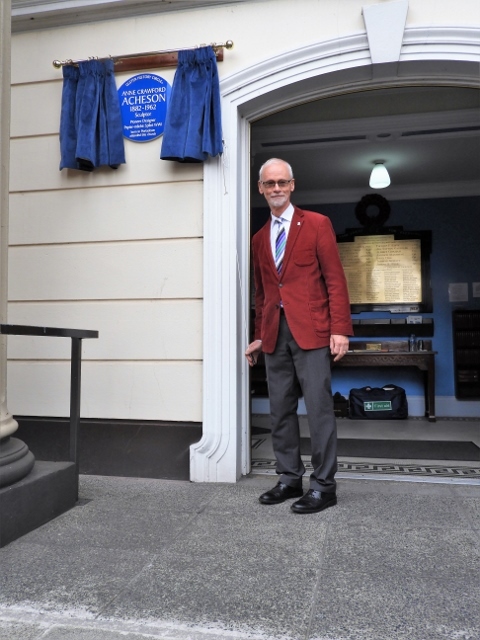 John Faris, great nephew of Anne Crawford Acheson unveils the Blue Plaque. Richard Hanna, Language and Education Director,Ulster-Scots Agency, Chris Spurr,Chairman Ulster History Circle,Rev.John Faris, Heather Faris and Doug Beattie, MLA. Guests on the steps of First Portadown Presbyterian Church.